World War II veterans and other students at the University of Iowa in 1947. That year, due to federal assistance from the GI Bill, 60 percent of the school's enrollment was made up of veterans. Even in Oklahoma, where tuition increases have been among the lowest in the nation, parents are dismayed. In Stillwater, Okla., Jeffery Corbett's daughter is attending community college. Corbett, a fundraiser for a nonprofit, says a high school diploma just won't get you very far. And he knows; he doesn't have a college degree. "I think about it all the time, because I realize [how] it has limited me, by not having that piece of paper," he says. And that, experts say, is the source of parents' frustration today. A college education seems unaffordable at the worst possible time — when "people are really struggling," says Sandy Baum, a senior fellow at the Urban Institute who has spent much of her career studying trends in college costs. "The unemployment rate is high. Nobody's wages have gone up in recent years," she adds. "Increases in college tuition at public colleges, particularly in recent years, have really been unacceptable. And there's no question that that is a much higher percentage of median [family] incomes than it used to be." And yet, Baum says, somehow, families are paying for it. "And the reason people are paying for it is because the return to the investment is so high." No matter what a higher education costs them, most Americans think it will be worth it, she says. 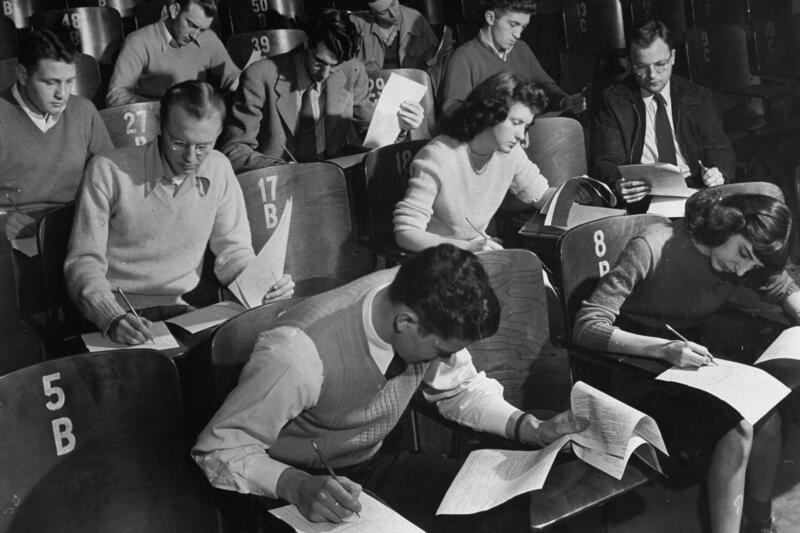 It was a different story 70 years ago, when most Americans thought college was only for the wealthy elite. That changed after World War II with the Servicemen's Readjustment Act of 1944, better known as the GI Bill of Rights. This sudden, enormous demand, Thelin adds, could have pushed college costs higher — but didn't, because states embraced the idea. The booming postwar economy allowed them to spend unprecedented sums of money to expand higher education. "The biggest problem that was facing governors and legislators was, could we build campuses fast enough?" Thelin says. At the same time, Thelin says, from "1965 to 1972, colleges and universities dug very deep into their own pockets to provide grants and other forms of student financial aid in partnership with the new federal programs." "So it's not that colleges are spending more money to educate students," Baum says. "It's that they have to get that money from someplace to replace their lost state funding — and that's from tuition and fees from students and families." "There's certainly evidence that people don't know how to measure the quality of a college education," she says. "They think that if it's expensive it must be better. I don't think colleges want to have high prices, but I do think they see strategic reasons why it may be in their interest to have high prices." For the average family though, the pricing of a college education has become a shell game. As colleges love to point out, there's the sticker price and there's the real price. That's great for the few who can navigate the labyrinth of financial aid sources and discounts that institutions say they offer. That brings us back to those bewildered, if not wary, parents who see no end to the rise in college costs. Parents like Heather Gillette, a mother of two in suburban Seattle. Her daughter attends Washington State University, where she's studying to be a veterinarian. There was never any question that her kids would go to college, Gillette says. The only question is what they would study. Even so, she says, "it does come down to the parent making the decision about what they can afford." We have been hearing a lot about the stunning upward spiral of student debt and here's a number for you. It has now surpassed a trillion dollars, higher than America's collective credit card debt. As part of our month-long look at how Americans are paying for college, NPR's Claudio Sanchez examines how soaring college costs have forced families to put a much larger share of their income towards higher education. CLAUDIO SANCHEZ, BYLINE: If you want to get an earful about paying for college, listen to parents from states where tuition and fees have skyrocketed in the last five years. In Arizona, for example, parents have seen a 77 percent increase. Why? GRACE LAMOUREAUX: I think that's the question most parents ask themselves. SANCHEZ: Grace LaMoureaux of Sun City, Arizona says her son couldn't afford to stay in college. She worries her granddaughter won't either so she's trying to help her with tuition. LAMOUREAUX: How much is going to come out of my pocket and where am I going to get that money? SANCHEZ: Parents in Georgia have seen tuition go up 75 percent, Washington State 70 percent. Even in Oklahoma, where tuition increases have been among the lowest in the nation, parents are dismayed. Jeffery Corbett is from Stillwater, Oklahoma. His daughter is attending community college. Corbett, a fundraiser for a nonprofit, says a high school diploma just won't get you very far. He knows. He doesn't have a college degree. JEFFREY CORBETT: Oh, I think about it all the time because I realize what it has limited me by not having that piece of paper. SANCHEZ: And that, experts say, is the source of parents' frustration. Today a college education seems unaffordable at the worst possible time. SANDY BAUM: College prices are going up so fast when people are really struggling. The unemployment rate is high. Nobody's wages have gone up in recent years. SANCHEZ: Sandy Baum, senior fellow at the Urban Institute, has spent much of her career studying trends in college costs. BAUM: Increases in college tuition at public colleges, particularly in recent years, have really been unacceptable. And there's no question that that is a much higher percentage of median incomes than it used to be. BAUM: Somehow people are paying for it. And the reason people are paying for it is because the return to the investment is so high. SANCHEZ: No matter what you pay for higher education, most Americans think it will be worth it, says Baum. But it was a different story 70 years ago, when most Americans thought college was only for the wealthy, the elite. That changed after World War II with the Servicemen's Readjustment Act of 1944, better known as the GI Bill of Rights. JOHN THELIN: The GI Bill made college affordable for an entire group of veterans who never would have thought of going beyond high school. SANCHEZ: John Thelin is a professor at the University of Kentucky. THELIN: And I am the author of "A History of American Higher Education." SANCHEZ: Thelin says the GI Bill was an unexpected success, enrolling just under eight million veterans, 10 times the number the authors of the bill had predicted. This sudden, enormous demand, says Thelin, could have pushed college costs higher, but it didn't because states embraced the idea. The booming postwar economy allowed them to spend unprecedented sums of money to expand higher education. THELIN: The biggest problem that was facing governors and legislators was, could we build campuses fast enough? SANCHEZ: While states were investing, the federal government was carving out a huge new role for itself: helping families pay for college. It spawned the National Defense Student Loan program, which later became the Perkins Loan program. It did for civilians what the GI Bill had done for veterans, opening college gates even wider. Then, with the civil rights movement as the backdrop, the landmark 1965 Higher Education Act pushed for greater college access for women and minorities. Again, John Thelin. THELIN: And also what's important to note is in that same period, 1965 to 1972, colleges and universities dug very deep into their own pockets to provide grants and other forms of student financial aid in partnership with the new federal programs. SANCHEZ: Americans flocked to campuses with the expectation that the government was going to foot part of the cost. For many more Americans, says Thelin, college became affordable. THELIN: I think the turning point was around 1970. SANCHEZ: Double-digit inflation, an oil embargo, a sputtering economy - a perfect storm began to build. College tuition and fees climbed as much or more than the inflation rate. Private loans, heavily subsidized by the federal government, gradually replaced federal grants as the main source of money for both poor and middle-class college students. BAUM: So it's not that colleges are spending more money to educate students. It's that they have to get that money from someplace to replace their lost state funding, and that's from tuition and fees from students and families. SANCHEZ: While most institutions tried to keep costs down, Baum says some took advantage of the public perception that a high tuition means a quality education. BAUM: There's certainly evidence that people don't know how to measure the quality of a college education. They think that if it's expensive it must be better. I don't think colleges want to have high prices, but I do think they see strategic reasons why it may be in their interest to have high prices. SANCHEZ: For the average family, though, the pricing of a college education has become a shell game. As colleges love to point out, there's the sticker price and there's the real price, which is great for the few who can navigate the labyrinth of financial aid sources and discounts institutions say they offer. Which brings us back to those bewildered, if not wary, parents who see no end to the rise in college costs. Parents like Heather Gillette, a mother of two from suburban Seattle. Her daughter attends Washington State University, where she's studying to be a veterinarian. HEATHER GILLETTE: It was never a question that my kids were going to go to college. It was always a discussion from the time that they were babies that that's what they were going to do. But it does come down to the parent making the decision about what they can afford. SANCHEZ: It's a realization that a college education never will be the entitlement that many Americans thought it was 30 and 40 years ago. Claudio Sanchez, NPR News. Transcript provided by NPR, Copyright NPR.